The day dawned bright and sunny! Thank goodness – as some clothes had not dried overnight. After a very ‘interesting’ breakfast served in a basket delivered to our room and comprising plain and chocolate croissants, porridge in a pot (to have water added – ugh! ), fruit and chocolate muffins (white and brown), we set off for a very short days walk (8 miles). First we had to find the Wolds Way as we had turned off the route for Market Weighton and had walked in to the town along the road as it was so wet. With the help of the compass and a lot of peering at the map, we identified our route out eventually and headed out across fields. We were amazed at how dry the grass was, given the rain yesterday, but we were extremely grateful. 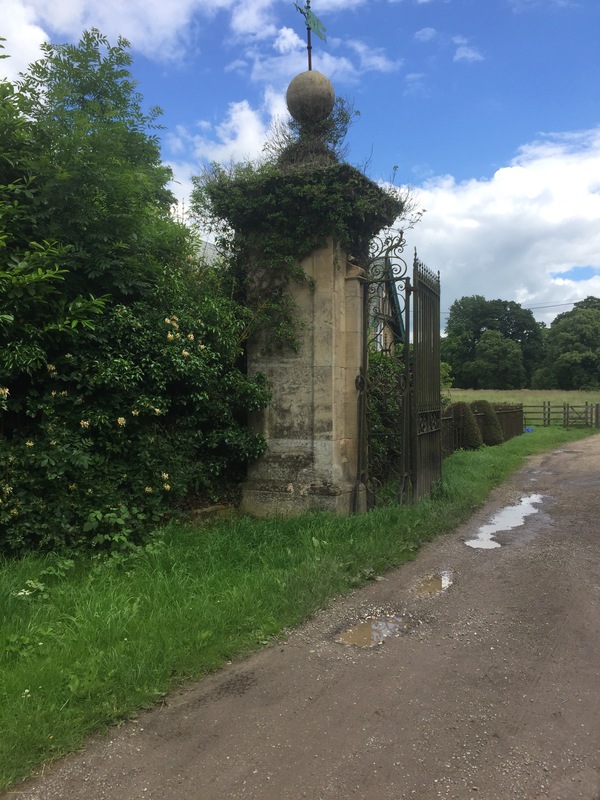 After a couple of miles our boots had begun to dry out and we came to the gates of Londesborough park which were very grand. Sadly the Elizabethan house has been long since demolished. Through the gates we passed a lovely gate house and continued on ahead through the park, and came across an historic deer shelter, thought to have been part of the original Elizabethan building ….. Very interesting – obviously deer were very well treated in Elizabethan times! Walking out of the park through more grand gates we came to Londesborough village where I realised I had been before when I stayed at Flamborough Head with the girls last year. Spooky! Walking through the village, having sighted but failed to get a photo of the 11th century sundial and Anglo-Danish over the Norman south door of the church as it had been covered with mesh to keep the birds off (so much for the aesthetics!) we admired the large estate houses and eventually came to a cross roads. 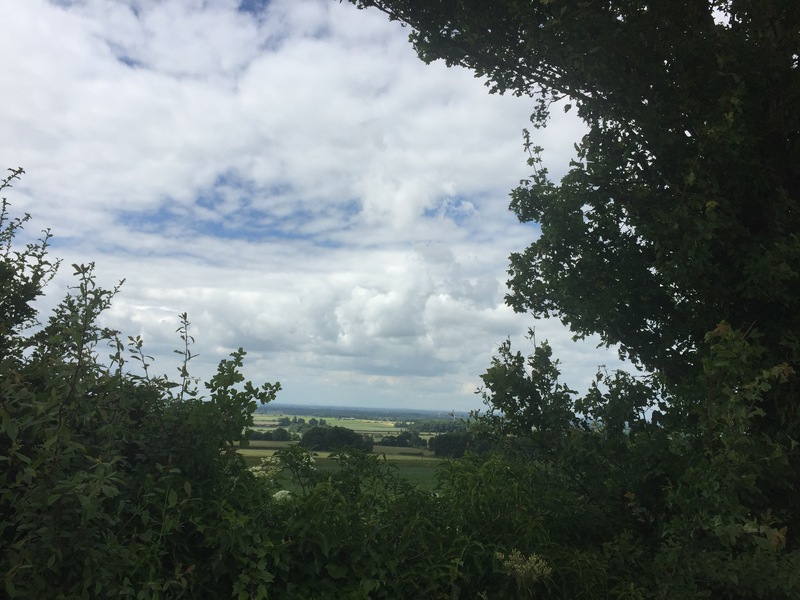 We walked up the hill out of Londesborough and out onto a road that gave great views over the vale of York (if you could see over the hedge!) and three major power stations – Drax, Eggborough and Ferrybridge. Having escaped a near nasty collision between a speeding white van and large lorry coming the other way and us scrabbling onto the verge at the side of the road, we walked through a farm yard and then across country to the village of Nunburnholm. We skirted the edge of a village and – rather oddly – the edge of a grassy field and started climbing up. During the inevitable descent of the next field we were treated to some amazing swoops and twirls of a red kite. Amazing! 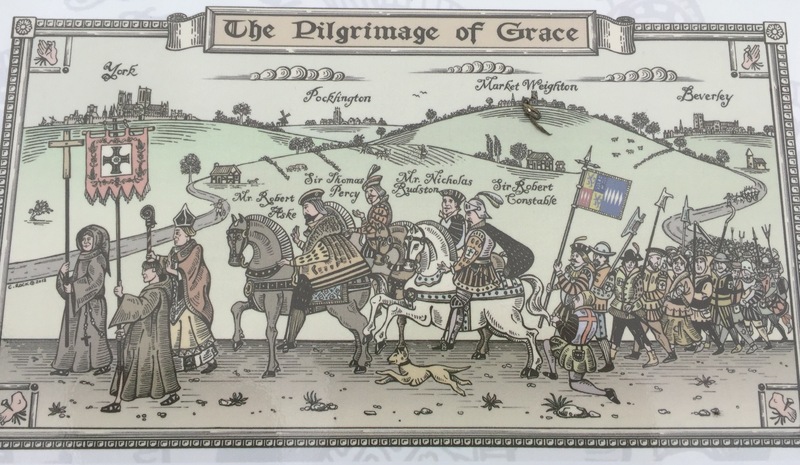 After crossing a minor road, skirting a small wood and crossing a meadow with young bulls in it, we walked along the edge of a corn field with more wonderful views and also an information board telling us about something called the Pilgrimage of Grace, which I had never heard of before. 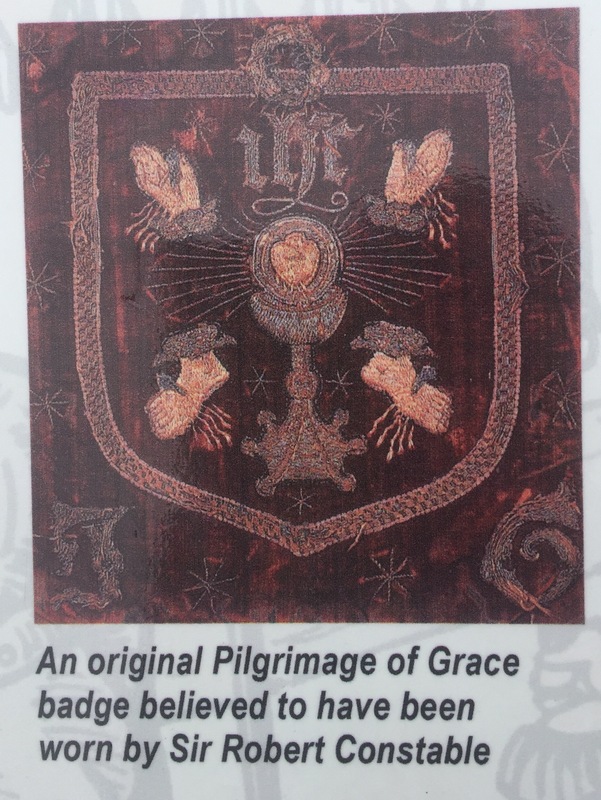 Apparently this was an uprising of northern Catholics against Henry VIII’s dissolution of the monasteries. In the end there were 50,000 involved in the stand against the King. Amazing and something I need to know more about!! 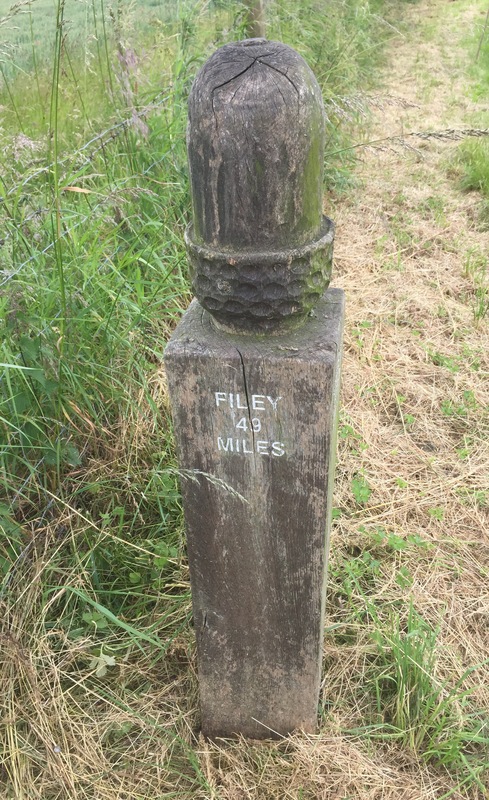 Nearby we were encouragingly told that it was only 49miles to go to Filey! Great! 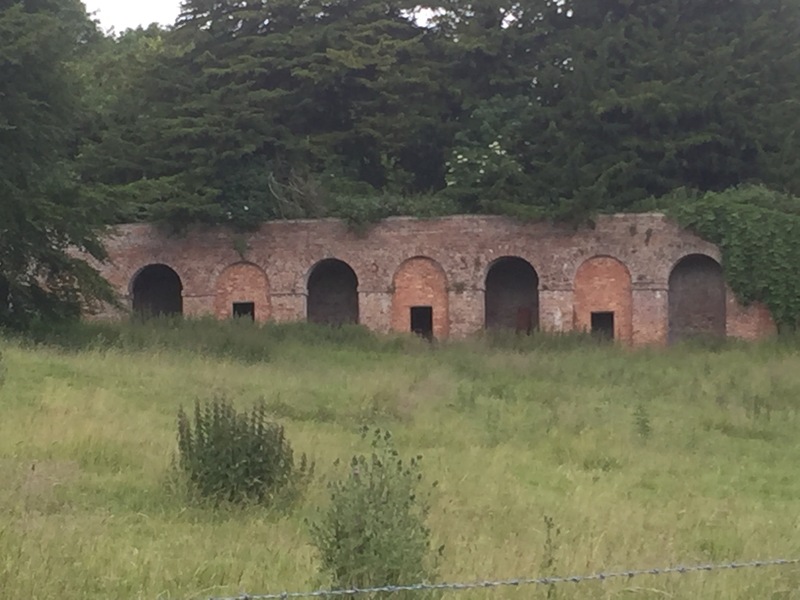 Shortly after this we passed through the farmyard of Low Warrendale Farm and after inspecting a barn full of piglets we wandered down the track to the road and took the road to Millington. As we were to arrive in the village before 2.00 pm, we both visualised and talked of the drink we were going to have at the pub shown on the map. Now sometimes you are the pigeon and sometimes the statue – however today was not to be a pigeon day. We arrived to find the pub doesn’t open at lunch time and the Ramblers Rest (a very nice looking cafe) was closed due to a power cut…. C’est la vie!